Jean Swanson’s election to Vancouver City Council is a step toward a political revolution in this city. News of this historic victory is already rippling around the world. Swanson came fourth highest in the ballot. But it is not just one of 10 seats on Council. Jean’s seat is the movement’s seat on City Council. It is a victory for the movement for the City We Need and for a rent freeze. Jean has vowed to use her political office as a tool for social and environmental movements to have a real voice in the decision-making at city hall. Her election has been overshadowed in the bourgeois media by the mayoralty races and significant changes to councils in several major cities across BC. To be sure, some of those on the right have noted her win with some alarm and have sent out warnings on social media of class war on City Council. And perhaps they are right – this city council will not be politics as usual. Despite not having the backing of the billionaires, the Coalition of Progressive Electors (COPE) ran a campaign focused on what ordinary people need in this city: a rent-freeze, a mansion tax which will provide the income needed to build modular homes to house all those who are currently homeless and to build public rental homes. As Jean said at the rally: “If there are 2,181 people without homes, then we build 2,181 homes.” COPE also campaigned for a “U-pass for the Working Class,” which would provide free transit for children and low-income people and a monthly pass of $41 for those with incomes below $50,000. Other policies included stopping landlords from raising rents between tenancies, banning “renovictions,” improving rental conditions, freezing rents for small neighborhood businesses, $10 a day childcare, introducing wards for elections, and much more. COPE policies and approach is based on the needs of the working class – a rarity in today’s politics. As well as the best policies, COPE’s campaign was the most visible and enthusiastic. The campaign on the streets featured regular tables across the city, bold artwork and several imaginative rallies and news conferences. COPE’s vote increased sharply since 2014 in the races for Council, School and Park Board. The campaign launched last year by Swanson’s successful by-election (see report), where she came from nowhere to second place in three months of energetic campaigning, has already had an impact. Its success changed the entire election conversation this year with every party promising action to deal with the unaffordable housing that is Vancouver. Swanson’s call for a rent freeze and a mansion tax dominated the by-election. Of course, the pro-developer parties’ answer is to give more licence to the developers. These parties continue to push the myth that the market will supply affordable housing, when it is the market that has created the crisis. In this election other candidates echoed Jean’s call for a mansion tax and to build non-market public housing. And most significantly, the provincial government announced in early September that rents could go up by 4.5%. Virtually no workers in BC got a 4.5% pay increase last year. After a huge outcry, in which COPE was prominent, less than a month later the government changed course and decided to only allow a 2.5% increase. While still too much, this change saves an average renter in Vancouver about $500 a year. The dominant feature of this year’s election was the collapse of Vision Vancouver, the ruling party for a decade. Vision split from COPE in 2005, as a soft left party with a friendly attitude to developers and casinos. It promised to end homelessness in four years. Its method to tackle housing problems was to cozy up to developers and expect the market to deliver. Instead, ten years later homelessness is worse, and housing is unaffordable for all but the super-rich. Vision was hated across the city, especially among working-class former voters after its betrayals. Their mayor, Gregor Robertson, decided not to run again, and then they were off, on and off again about a mayoral candidate. Of the six councilors elected four years ago only one ran again and was defeated. Vision was virtually wiped off the map (except for lone School Trustee, Alan Wong, who limped into last place). In normal circumstances, the right-wing NPA would have won a majority with a few Green opposition candidates. Across the world, center and former left parties are collapsing and if the left is weak and uninspiring then right parties, often populist right, are winning power. But these were not normal circumstances in Vancouver. Swanson’s by-election impact revitalized and energized the left. On the right, there were a range of new, more populist and socially-conservative parties. The election saw a bewildering number of candidates, with 71 running for 10 places on council. The so-called Non-Partisan Association (NPA), a long-time Vancouver right-wing establishment party, worked hard to take over City Council. Billionaire Chip Wilson, founder of the Lululemon clothing empire and owner of Vancouver’s most expensive house, a $78 million mansion, came out as an early backer of Ken Sim, the NPA’s mayoralty candidate. Despite changed rules on donations which imposed some restrictions, the NPA raised nearly a million dollars from its rich friends. There was a great deal of jostling and shifts around Mayoral candidates. The NPA’s Sim faced three other right candidates with some support and profile. After several farcical shifts, Vision did not run a candidate for mayor; no one wanted to face the inevitable humiliation. COPE, the Greens and OneCity also did not run candidates. There were two progressive mayoral candidates, Kennedy Stewart and Shauna Sylvester. Stewart, a former NDP MP, had the backing of most of the NDP and the Vancouver & District Labour Council. Sylvester, who was working at a university, was supported by some federal Liberals and environmentalists. The mayoral race was Stewart’s to lose and he nearly did, beating Sim by just 984 votes. Why? Many housing activists were put off by Stewart’s failure as Burnaby MP to defend his constituents when faced with mass demolition of affordable rental buildings which the City of Burnaby rammed through. Burnaby’s mayor, Corrigan, is close to the NDP (and was defeated in this election). Stewart’s campaign lacked the excitement of COPE’s or campaigns such as Corbyn’s in Britain or Sanders in the US. It was like recent NDP campaigns, with some good policies but without energy. Sylvester was seen by many progressives, especially women, as less of a slick politician than Stewart. As the campaign rolled on, she gained more support and came third with 20.5% of the votes. Following the election Vancouver City Council has five right-wing NPA members and five broadly progressive councillors – three Green, one OneCity and Jean Swanson. COPE’s two other candidates, Derrick O’Keefe and Anne Roberts, came 14th and 16th. Only two of the councillors, Carr and De Genova, were on the previous council. Vision ran five candidates, and none were elected, and most were far down the list. In the election for Park Board, OneCity did not run any candidates. Both of COPE’s candidates, Gwen Giesbrecht and John Irwin, and the Green’s three candidates were elected, along with two NPA candidates. Neither of Vision’s two candidates were elected. The hard-right of Coalition Vancouver and Vancouver 1st ate into the NPA’s support so that three of their candidates failed to be elected. On School Board there was a similar pattern for the nine places. Greens topped the poll and elected three. COPE elected Barb Parrott, a former activist in the teachers’ union. OneCity gained one seat while the NPA elected three. The only elected Vision candidate was for School Board. This was at the cost of Diana Day, COPE’s second candidate, losing by 663 votes to Vision. Again, the split on the right probably blocked the NPA from electing more candidates. The turnout in 2104 was 181,707 and in 2018 it was 176,450, a small drop of just over 5,000 votes, so the figures for the two elections are roughly comparable. In most elections, most Vancouver voters think they are voting for progressive candidates, federally Liberal, Green and NDP; provincially NDP and Green; and in the city Green, One City COPE and, in the past, Vision. Of course not all of these parties, if in government, carry out progressive policies. In the mayoral election Stewart and Sylvester were seen as progressive candidates and their combined vote was 49% of the total. The four right-wing mayoral candidates gained 44% of the votes and the remaining 5% was split between a range of 15 quirky parties and individuals. On School and Park Boards the progressives gained majorities. Yet the Council is split five to five and the NPA were only 3,576 votes short of a majority. What happened? First of all the NPA’s vote was down compared to 2014. Their highest vote for a councillor in 2014 was 68,419 while in 2018 their best vote was 53,324. Their vote for Mayor, School and Park Boards were all significantly down, by between 20% and 33%, and they lost School and Park seats. The further right parties clearly ate into the NPA’s vote. Yet on Council, they increased their number of councillors from three to five. The tale of this election, alongside Swanson’s victory, is the rise of the Greens and demise of Vision. The Greens are seen as progressive, but can gain support from soft right voters. They are rising in BC, holding the balance of power in the provincial government by supporting the NDP minority. Adriane Carr, their sitting councillor, topped the polls in 2014 and has wide name recognition and general respect. They have yet to hold power so have not revealed their weaknesses. In this election they were strategic, running partial slates to maximize their votes. They decisively topped the polls for Council, School and Park Boards, with a significant margins over the next highest party. They increased their best vote for School and Park and gained seats. On council their highest vote dropped slightly from 74,077 in 2014 to 69,885 this year, but still they increased the number of seats from one to three. They had a strategic approach. In complete contrast, Vision’s campaign combined incompetence with hubris (dangerous arrogance leading to a fall). Long before the election it was clear that Vision was at best on life-support if not already dead. Only two of the twelve Vision candidates elected in 2014 ran again. They couldn’t make up their minds about running a mayoral candidate and finally, after picking one, he then dropped out. The day before the election (but after advance polling) Vision withdrew support from one council candidate. In spite of being a zombie party they ran ten candidates, with five candidates for council. The Vancouver & District Labour Council (VDLC) mistakenly tried to breathe life into the Vision corpse. In a complex process the VDLC ended up backing their so-called progressive slate with support for four Vision Council candidates. They also supported three Vision candidates for School Board and two for Parks. This exaggerated support was not enough for Vision and they ran five council candidates. Of the nine Vision candidates the VDLC endorsed, only one was elected. In spite of VDLC endorsement, Vision’s support plummeted. Possible, but weak, reasons for the VDLC leaders to back Vision were that it had not attacked the city’s workforce (unlike the NPA) and by encouraging developers meant there were jobs for building trades’ members. However, increasingly neither construction workers or city employees can afford to live in the city they build and service. In addition, Vision agreed to privatize some new parks. It is certain that COPE and probably OneCity would also have not attacked city workers and would have encouraged construction of affordable housing. The VDLC refused to endorse two COPE candidates, Anne Roberts, a former COPE Councillor who stood by her principals, and Diana Day, a strong Indigenous activist. There is no doubt the lack of VDLC endorsement cost Day a place on School Board. Vision, with support from the VDLC leaders, was the spoiler of any progressive slate. It nearly gave the NPA a majority on Council. If Vision only ran two Council candidates or, even better, accepted its demise, it is most likely more COPE, OneCity and Greens would have been elected and the NPA would have fewer seats. As the campaign progressed it appeared that the VDLC put most of their efforts into OneCity and Stewart for Mayor, realizing they had backed a dead horse –Vision. This helped OneCity to substantially increase their votes and go from no elected representatives to get two of their five candidates elected. Unfortunately the VDLC leaders made their endorsement decisions looking in the rear-view mirror, rather than forward as leaders should. They missed an opportunity for a strong left force on all three bodies and to help build COPE and the movement for working-class policies. COPE, after the Greens, had the best success rate for its candidates and had the biggest increase in representation, going from none elected to four. In votes as well, COPE soared with increased support of around 40% for its highest polling candidates for Council and Park Board and 24% for School Board. Socialist Alternative is proud of the work we did to get Swanson elected. SA was committed to last year’s by-election. We were the foundation of the campaign in Grandview Woodland (G-W), a working-class area of the city. This neighborhood is 5% of Vancouver’s population but provided 14% of Swanson votes with the best result from any polling station. Socialist Alternative continued to be a core part of Swanson’s campaign, helping with the transition from Team Jean to joining COPE and launching the City We Need. We maintained activity in G-W with regular tabling throughout 2018, collecting over 3,000 signatures on the Rent Freeze petition. The election campaign began September 4. Over six weeks we knocked on doors in 131 apartment buildings and spoke to over 1,200 people. Support for COPE was solid at 63%. One week before the election, Socialist Alternative’s Seattle City Councillor Kshama Sawant spoke at a packed boisterous COPE rally that raised $8,500 (see report). In the morning Sawant and the three council candidates met the editor of Vancouver’s Georgia Straight for an extended interview. On election day, Socialist Alternative members and several dozen more volunteers worked from 7:30 am to the close of polls. All day, across the neighborhood, the team knocked doors and leafleted 80 apartment buildings and had several tables. In the evening we went back to the 17 best apartment buildings for a second canvass of the people who had been out earlier. Vancouver politics has been transformed. For years the landscape has been dominated by the developer-backed NPA and some form of leftish party. Now the developers, after their affair with Vision, will return to the NPA. There is a possibility, if the various right populist parties come together, they could win a base. Vision is no more. The Greens are now well established in the city. OneCity may be the main vehicle of the labor leadership, a safe soft-left party. COPE can become the party of struggle, of the movements and appeal to labor activists. The election of four COPE candidates, especially Swanson on Council, provides the base for the next stage of Vancouver’s political revolution. This will use the elected representatives to help build movements outside the elected chambers which, in turn, will give them increased power within the chamber. At the end of the election party, Swanson quoted Sawant, “Movements are like waves that crash against a wall and they subside unless there is a political response and presence.” COPE’s success has opened a crack in the wall, and together the movements and COPE can wash away those walls. Jean will need a strong and determined movement to counter the pressures that she will face from the elected corporate politicians and the business interests they represent. The experience of Kshama Sawant in Seattle has served as an inspiration for COPE’s campaign and for Jean, personally. 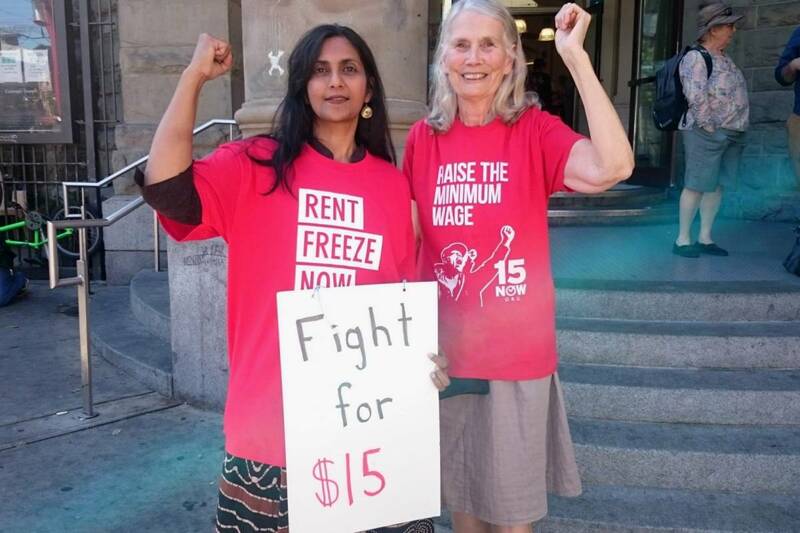 Kshama has benefited from the experience and discipline of Socialist Alternative in the US. While Jean does not have the same support in COPE’s looser structure, hopefully, Socialist Alternative and others in COPE will provide the needed support. This election result, although ignored by the mainstream media, will reach activists across Canada and internationally and give inspiration. Without Swanson’s campaign last year and COPE’s this year it is likely Vancouver would have a right-wing council. Policies such as those of COPE and the City We Need are the best response to the growing anger about poverty, stagnant living standards, unaffordable housing and all the other woes of austerity-ridden society. In Vancouver there is the outline of populist right parties gaining support. Without Swanson and COPE they could have made bigger inroads. Charlie Smith, the editor of the Georgia Straight wrote a week before the election, “If all three COPE candidates are elected, it will send a signal to the rest of the country that a more radical approach can reap results at the ballot box. This, in turn, could persuade the federal New Democrats to take a left turn in advance of the 2019 election to regain some relevance with their base.” Unfortunately, with only 4 out of 7 COPE candidates elected, it is likely that the NDP leadership will ignore the lessons of Vancouver, as they have done of Sanders and Corbyn. However, among activists, the example of COPE in Vancouver alongside Québec Solidaire show that bold policies and enthusiastic campaigning provide the best way to build the movement and win real gains for the working class.